Cut eggplant in half and scoop out the center leaving about an inch around the edge. Drizzle with olive oil and season with sea salt and black pepper. Chop center part into small pieces and set aside. In a large deep sided skillet, add three tablespoons of olive oil. When hot add onions and garlic, saute until soft. Add ground beef and the center part of the eggplants, stirring occasionally until browned and cooked. Mix in tomatoes, rice, and parsley. Season with sea salt and black pepper. 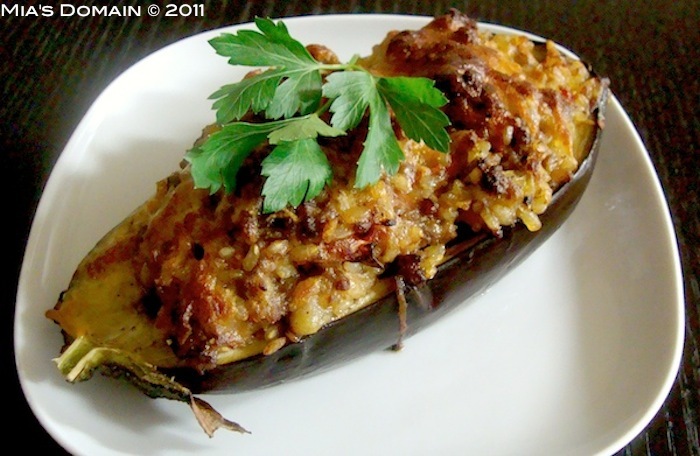 Drizzle olive oil over a baking sheet and arrange eggplants and fill with the meat mixture. Sprinkle with mozzarella. Season with sea salt and black pepper. Bake for 1 hour. Serve immediately.